This low-carb version of classic apple pie features a buttery, flaky crust filled with a luscious, spiced “mock apple” filling, which is much lower in carbs than actual apples, and tastes very similar to the real thing! The “apples” in this recipe are chayote squash, which have a firm texture, are flavorless, and sugarless, and when cooked with lemon juice, sweetener, and spices, taste remarkably similar to roasted apples. 1. Prepare the filling: place all the boiling stage ingredients into a saucepan and bring to a boil. Add the peeled and chopped Chayote and boil for 30 minutes until softened, then drain and transfer to a mixing bowl. Cool to room temperature. 2. Preheat the oven to 325F. Grease a 9-inch, round pie pan with butter, and line with parchment paper. 3. Make the crust: place the almond flour, arrowroot, and salt in the bowl of a food processor and process until combined. Add the cold, cubed butter, and pulse until the mixture resembles pea-size crumbs. Add the egg white-water mixture and continue to pulse until you have a smooth batter. 4. Divide the mixture into 2 equal parts. Spoon ½ of the thick batter onto a sheet of parchment paper. Using a spoon, spread the mixture into a circle roughly the size of your pie dish. Place another sheet of parchment on top and place into the freezer for 10 minutes to firm up. Repeat this step, so you have two discs of pastry in the freezer. 5. Transfer 1 of the pastry circles from the freezer to the counter and use a rolling pin to smooth out the dough. Remove the top layer of parchment and flip the dough into the pie dish. Carefully peel off the second layer of parchment and press the dough into the dish. Trim the edges so the crust is even with the top of your dish. The pastry dough will soften quickly after it is removed from the freezer, so work fast for best results. If the pastry has cracks, simply fill them in with excess dough. 6. 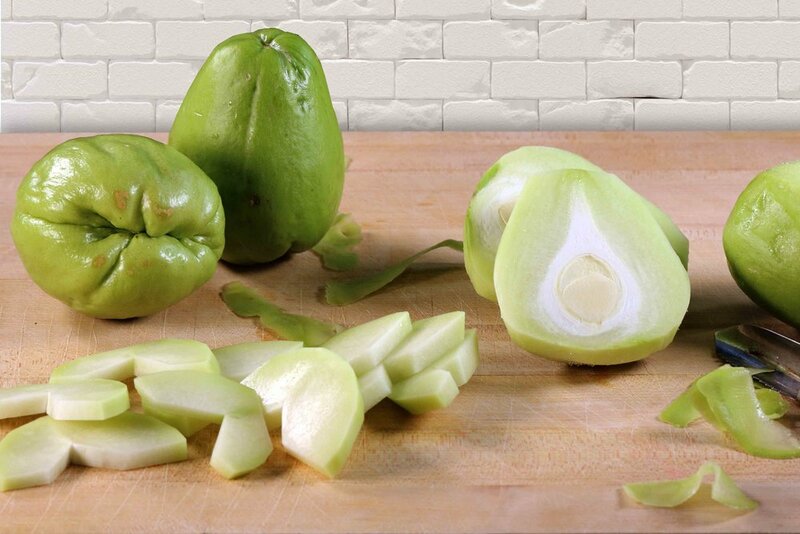 Make the filling: Use paper towels to dry the boiled chayote squash, then transfer to a mixing bowl, and add all the filling ingredients. Mix the squash until fully coated, and spoon into the pie crust. 7. Transfer the second pastry circle from the freezer to the counter and use a rolling pin to smooth out the dough. Remove the top layer of parchment and flip the dough into the pie dish. 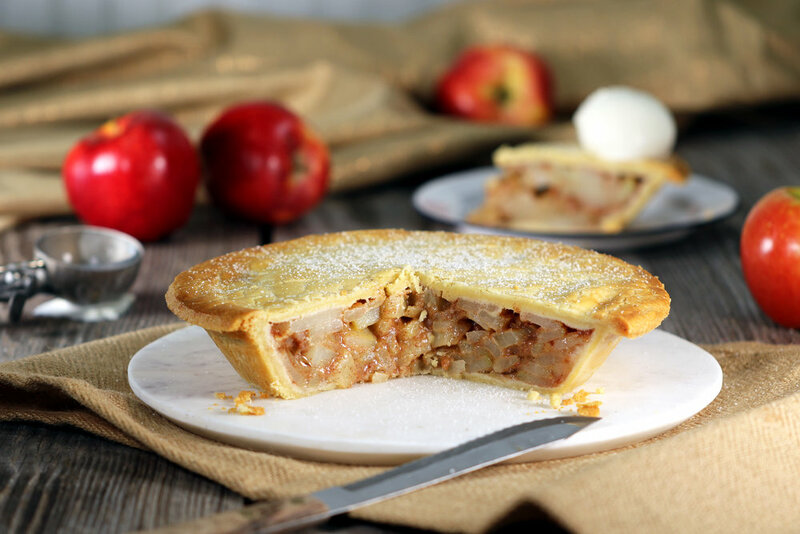 Carefully peel off the second layer of parchment and place the dough over the apple filling, crimp the edges together and brush the top of the pie with beaten egg. 8. Place the pie into the oven and bake for 50 minutes until the pastry is golden-brown and flaky. 9. Remove the pie from the oven and cool in the dish for 2 hours. After it is completely cooled, slide the entire pie out of the dish and enjoy.